The Outing Festival takes place among some of the most beautiful landscapes in the west of Ireland on Wild Atlantic Way, if not the world. During your weekend with us, you’ll be on the doorstep of some of the most rugged and incredible scenery Ireland can offer, as well as some of its top tourist attractions. We’ve worked with local attractions and businesses to get great deals for you, on activities and attractions during the day on Saturday 28th and Sunday 29th September 2019. Of course, we’ll also make sure you are back again in time to hit the dance floor! We at The Outing Festival would like to thank all staff and crew who help put on LOVE BOAT on THE QUEEN OF ARAN The Doolin Ferry a Big Thank You. For more information or to reserve your spaces for your own trip this year ring Tel. 065 707 5555 or Email info@doolinferry.com. 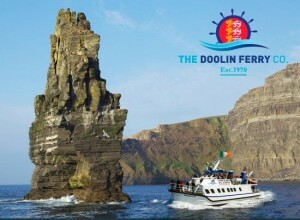 The ferry departs from #1 Doolin Pier, Bill O Brien, THE Doolin Ferry Co.